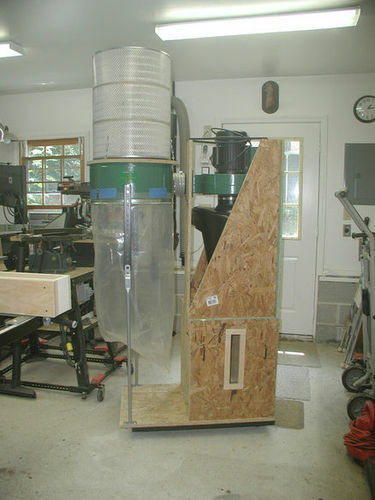 A few years ago I donated my harbor freight 2 hp collector to a woodworking coop I help out at. I had done the 2 stage mod with the $30 inlet/outlet lid from woodcraft and a metal trash can. It works pretty good. I just bought another collector and am considering doing the same thing but noticing the Oneida deputies being touted as better. Is there a big quality difference between the trash can mod and the deputies ? And if so is there a big difference between the super deputy and the smaller ‘deluxe’ deputy ? I know the smaller one is only for 2-3” hoses but figured a reduction hose might suffice since the separated dust takes years to fill up the trash can. I know I’ll lose something with the reduction but I want to make sure it’s a big enough loss to justify another $100 on the larger deputy. Or is it all hype and the trash can method is just fine ? I’m in the same boat you are and I am looking at the Oneida Super Dust Deputy (SDD) Deluxe – 4” in and out and a drum. If you go to the Oneida.com site there are several different models. Three models with different in/out sizes, a metal one and several smaller (2”) models. Any of the larger models will complement HD Freight collector but the smaller ones will only choke down the collector badly. Smaller ones work well with a shop vacuum. I have been using one for several years.To answer your main question they are all cyclones and will greatly improve your collection over the home made simple trash can design. The bigger question how much money you wish to spend. I’m building mine over a number of months so the money question is spread over time. I’ve never built a trash can design so I can’t comment on loss of suction. Best of luck however you go. Just emptied a full 20 gallon trash can yesterday. Harbor Fright dust collector made sitting on homemade Thien Baffle. I vent outside and in 5 years of use have never seen noticeable chips or dust at the vent outlet. I just went through all of this last year. I looked at the Thein -vs- SDD and read everything I could get my hands on. Google Bill Pentz. He has some great articles on dust collection theory and practice. I tried a basic trash can separator and was not very happy with the results. I still had quite a bit of dust making it’s way to the bag on the collector. I was losing a lot of CFM’s and my blower just wasn’t big enough to make this work well. I gave very serious thought to building a Thein seperator like many of the folks here have done. They have reported pretty good results. I was starting with a basic DC (Jet DC1100) so that sounded like the best way for me to go. After reading Bill Pentz’s work on dust collection, I became more interested in cyclones. Most were just too expensive. 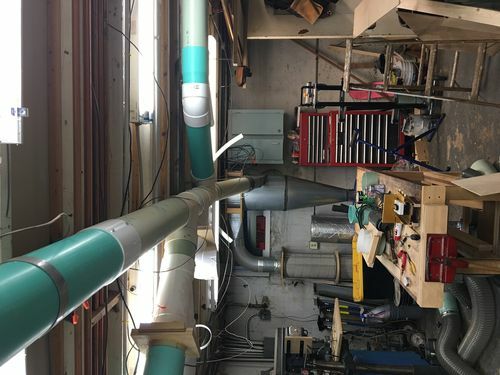 I wanted to have a ducted system and I wanted to squeeze the most out of what I had available so for me the Super Dust Deputy began to make the most sense and was affordable. There is a lot that goes into making a system efficient. Bill does a good job explaining that. I also leaned heavily on the guys at Oneida for help but my biggest influence were the Lumberjocks. They were very patient and helpful. I have been using mine for a year now and have no complaints. Just my 2 cents. Your results may vary. I started off with a shop vac and the Dust Deputy. Wonderful little thing! Upgraded to 3HP dual bag Grizzly and 16” top hat Thein Baffle for economical purposes and the fun build project. Now have the 3HP motor sitting ontop of a Super Dust Deputy XXL (6” inlet/6”outlet). 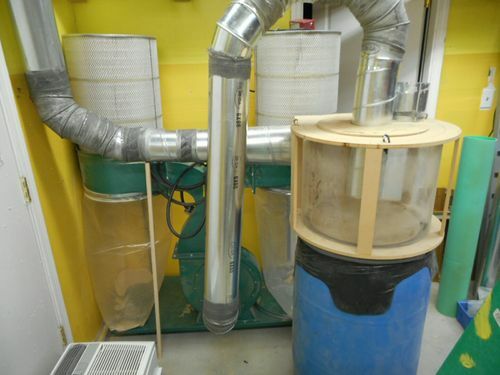 Yes…there is a difference in suction, CFM, and separation between the baffle and XXL. 10-20% difference. Is that big? Maybe. Maybe not. I would of kept the baffle but made the effort to reclaim floor space and the XXL was the answer. The Pentz system. He has detailed plans. I have to open all my photos in Microsoft Paint and re-save them or they do the same thing. Frustrating! You definitely do not want to use a separator with an inlet or outlet smaller than you mains. That will restrict the airflow thru the entire system. 4” mains are the minimum for a small system. 6” if you have a larger system with more horsepower. CFM thru the pipes needs to be calculated to assure adequate airflow to move the chips. Use the Bill Pentz spreadsheet. Eventually this will find a semi-permanent location in my basement shop and be plumbed into 5” ducting with 4” drops. On a side note, the upgraded DC has a footprint less than 2 ft longer and less than 1 ft wider than the stock HF unit. I’ll be using it temporarily as a 1 machine at a time unit, as I’ve reduced the 5” inlet on the SDD to 4”. From what I’ve read on the internet, the trashcan separators will reduce the CFM more than the cyclones. But take this for what it’s worth, the cyclones also reduce the CFM’s a bit too. 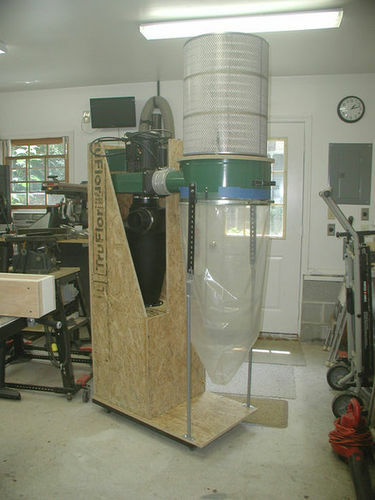 Which is the reason you have to go big with the blower if you’re using any sort of pre-separator. And assuming you have enough horsepower and blower capacity, you need to run the largest size ducting your system will support. If you’re only concerned about dust collection at one machine at a time, the smaller systems should be adequate. But, there is a whole lot of data on the internet about how many CFM’s each machine requires for maximum dust collection. 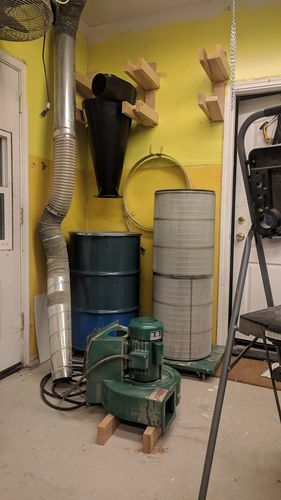 I was originally using a trash can separator with my HF dust collector. I did mods adding the Super Dust Deputy and it works a lot better than the trash can separator.